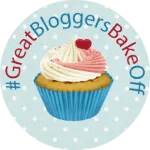 When the lovely Mummy mishaps and The Crazy kitchen had the idea for “The great Bloggers Bake Off” it was clear we had to join in! Bernard is an impressive baker and we’re all impressive cake lovers, so it would have been rude not to have a go! So here is our take on this weeks sandwich cake – Lemon and Poppy seed – with blueberry jam and butter cream filling. And it’s all gluten free! Standard sponge mix – except – when you have measured the flour take out a tablespoon of it and add the custard powder – gives a nice silky texture and excellent vanilla taste! That looks SOOOOO moist and delicious! Jealous! That looks divine Mary & I would never have guessed that it was gluten free! we had lots of fun making it! – looking forward to next week! Always! can’t be doing with just a think smear! it tasted lovely! We’ll cook GF as much as we can, although we’ve not really mastered bread yet so we might do ‘normal’ for next week! not sure that expert is the term – but we’re certainly learning fast! This looks LUSHNESS! *must resist cake*! Mammasaurus recently posted…Saturday is squatting caption day! This is making me drool. Will have to try this!